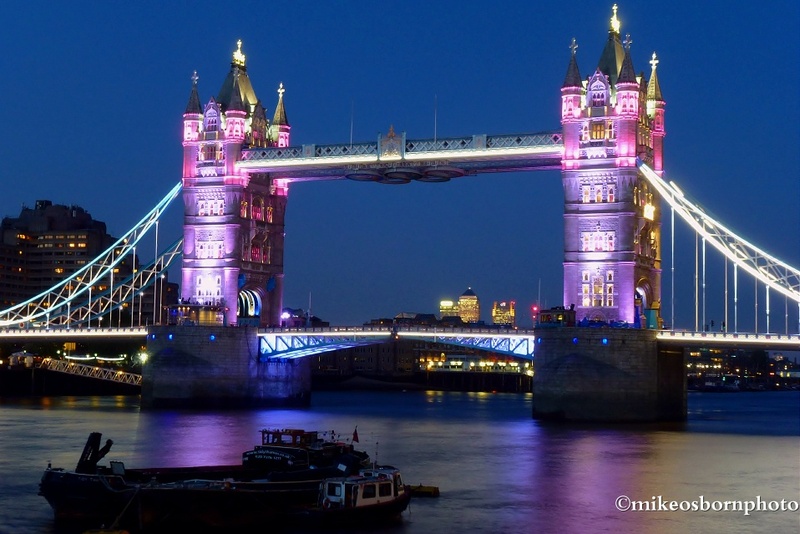 London’s iconic Tower Bridge in all its glory on a summer’s evening. Just days before the start of the Olympics, it is being illuminated in various colours to mark the imminent arrival of the games. Just after this pink and light purple show was a patriotic burst of red, white and blue. I was a bit too early to see the Olympic rings unfurl from the top of the bridge – they’ll be on display and lit up in the evenings during the games. Coming back to capture this on another warm, pleasant evening will be anything but a drag. Oh, how neat! Fabulous pic. Thank you Peggy :-) The bridge does look gorgeous at the moment. Next weekend I’ll get it complete with the Olympic rings (which you can just about see at the top between the towers). It still looks gorgeous. You guys definitely ready for the Games. Great picture! Thank you Alexander. Yes, it’s hard not to catch the fever now. Looking forward to Friday’s opening ceremony and seeing the Olympic rings on the bridge the following night! Beautiful shot. In terms of composition I think having the boat in the foreground is a great idea as it gives good depth to the image. Thank you very much Noeline. Yes, a friend on Flickr made the same point. I’m glad I kept the boat in the frame. All lit up like that in pink/purple, it kind of reminds of Disneyland. Nice shot. Thanks Stevie. It is a bit fantasy wedding cake. I caught the bridge and its Olympic rings which are coming soon.